As a three Michelin star chef, Heston Blumenthal is known for quality and precision. And that’s what the Sage by Heston Blumenthal Smart Grinder Pro offers too. This highly programmable, highly functional machine is a regular feature on recommended buy lists and boasts an impressive 4.5-star rating. In this Sage by Heston Blumenthal Smart Grinder Pro review, we look at why. What is is good about the Sage smart grinder? Wow! Where to start? For coffee aficionados, there are so many great things about this machine, it’s hard to know. Should we start with the controllability, the ease of use, its clear display or its stylish looks? This coffee burr grinder has it all. This coffee burr grinder offers a lavish sixty different grind settings. Yes, sixty. It offers everything from coarse to extremely fine. The chosen grind and what brewing method it’s designed for is clearly displayed on the LCD display. With its sixty grind settings, the Sage by Heston Blumenthal Smart Grinder Pro, you can use the resulting grinds for every brewing method: espresso, cafetiere, percolator and filter. Should, over time, the burrs wear a little and not grind quite so finely, they’re easily adjusted to ensure that you continue to get the perfect grind every time. The bean hopper holds a generous 450g of coffee beans, a whole bag. It’s transparent so you can see when it needs topping up. Unusually, the hopper is airtight, so it keeps the beans fresh while they’re waiting to be used. Like the bean hopper, the grind collector is airtight, to keep the aromas in the freshly ground coffee. This machine can also take a portafilter cartridge to make making espressos easy and mess free. Despite all its functionality, this coffee burr grinder isn’t overly complicated when it comes to buttons and indicators. There are just three buttons and a dial. The dial lets you set your brewing method, whether that’s filter, percolator, cafetiere, or espresso, and this then automatically sets the grind and the time it’ll take to complete. For a double espresso shot, expect to wait around eighteen seconds. The three buttons allow you to manually set the grind and the time it takes to complete the grind, should your tastes differ from that. The third button is the volume selector, which can select multiple cups or single or double shots. Once selected, just hold down the button to confirm your choice. 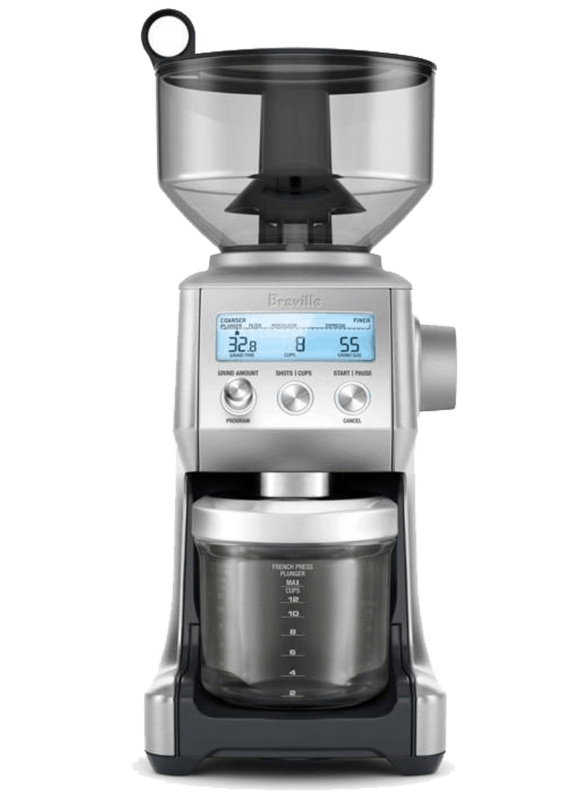 It has a clear LCD display, which shows the chosen grind, time, and volume of coffee grinds wanted, making it easy to use. Apart from the price tag – which is pretty reasonable considering what you’re getting – there really aren’t any complaints about this machine. Cleaning this coffee burr grinder is simple. The hopper and the grounds container are removable, as is the top burr, for ease of cleaning. A stiff brush is included with the machine for cleaning the burrs and getting out any loose coffee grounds. The simple answer is very functional. This Sage coffee burr grinder offers complete controllability and does everything you could possibly imagine when it comes to grinding coffee beans. Choose your brewing method, and it automatically sets the grind and time it will take. Prefer a different grind for your prefered brew? Then just adjust it using the buttons on the front. The LCD display shows you clearly what you’ve selected, and how long it’ll take. Even the burrs are adjustable. Should you not agree with Heston’s settings, there are ten different settings for the space between them. The closer they are, the finer the grind. We have to admit, we’re struggling here. It seems that there’s nothing that this Sage coffee grinder can’t do when it comes to grinding coffee beans. Again, there’s plenty to mention. Let’s start with the Intellidose system, which ensures the perfect volume of coffee every time, whether it’s a single dose of espresso or eight cups. Then there’s the airtight bean hopper that holds up to 450g of beans and keeps them fresh. The grinds container is also airtight to keep the ground beans as fresh as possible. And, in addition to that, this Sage coffee burr grinder also has a Smart Shot feature. This handy option is ideal for espresso lovers who don’t want the fuss and mess of transferring the grinds into an espresso machine filter. Instead, using a simple bracket, the portafilter cartridge can be slotted in to receive a single or double dose of ground coffee beans. The cartridge is then ready to be inserted into the espresso machine. The Sage Smart Grinder Pro is as stylish as it is functional. Its small footprint and metal casing – which is available in red, black or stainless steel – is combined with a sleek appearance to make it a stylish addition to every home. As this Sage by Heston Blumenthal Smart Grinder Pro review demonstrates, it certainly lives up to the reputation of its very famous designer. It offers complete controllability and a dazzling array of grinds in a simple to use format. With features and functionality abound, there’s really nothing to dislike about this coffee burr grinder. The only consideration for some potential purchasers will be the price tag.